Proven Operational Intelligence (OI) technology and applications delivering complete real-time event monitoring and processing that are easy to deploy and easy to use. Integrating real-time intelligence, GIS data, historical crime statistics and up-to-the-second operational information can help provide invaluable insight for law enforcement agencies around the country. With Simulyze's true, advanced Operational Intelligence (OI) platform, law enforcement personnel can easily and fully integrate structured and unstructured data with a customized graphical interface. 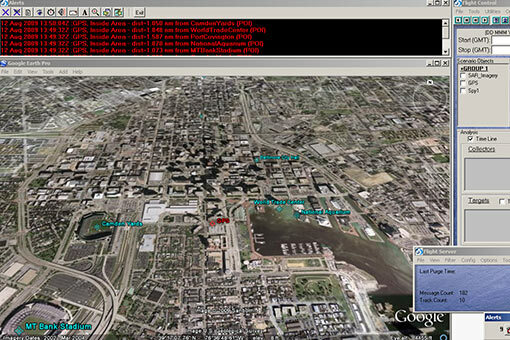 Simulyze's Mission InsightTM commercial off-the-shelf (COTS) application accommodates data regardless of format or originating program, including GPS coordinates, weather data, SIGINT and even internal proprietary information, to provide a Common Operating Picture (COP) of any situation. The technology is a valuable resource for accurate mapping of crime statistics, monitoring first responders during major events to better match resource to what’s needed and what’s available, surveying and monitoring airspace and remotely analyzing areas of interest for activity to ensure the safety of personnel. With its big data integration capabilities, Simulyze can also aid in monitoring the entire workflow for inbound shipping traffic, including document management such as shipping manifests and notifications, to help ensure the safety of harbors and other maritime environments. The improved data insight that Mission Insight delivers improves real-time communication between command centers and law enforcement personnel during situations, leading to better resource allocation before, during and after any event. Mission Insight even enables law enforcement to record data for post-event analysis, as well as create simulation-based training exercises.